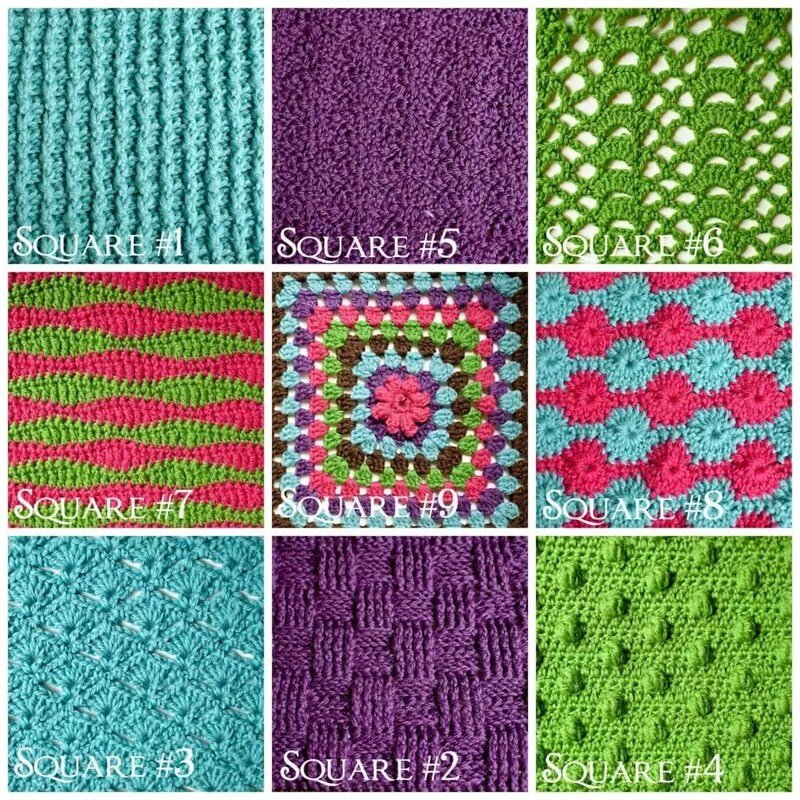 Let’s make the Long Wave Crochet Stitch Square! You are more than half way through the squares, way to go! Now we are getting into some fun stitches. This is the seventh block in the Crochet Stitch Sampler Baby Blanket CAL Sponsored by Red Heart Yarns and hosted by Marly Bird. You can click here for the first square, here for the second square, here for the third square, here for the fourth square, here for the fifth square, here for the sixth square. Where is the Full Pattern? During the Crochet-along (CAL) you will be able to get the written and chart instructions as well as the HD Video tutorial for the next step in the Crochet Stitch Sampler Blanket every Tuesday and Thursday. The full pattern will not be posted until the end of the CAL. Follow along and complete each step with my help as well as the wonderful group of other Marly Bird CAL members in the Facebook Group. In the group you can post pictures, ask questions and get general crochet support. I’m ready! Let’s get this party started! I chose the Long Wave Crochet Stitch square for this blanket because I liked the crazy colors and the way they looked squares. This really solid block is created by using the heights of the stitches to their full advantage. It is because of the different heights of the stitches that we get this super great visual effect. Click on the stitch below If you need a quick refresher on how to do it. Yarn: Red Heart, “With Love” (100% Acrylic; 315 yds/170g): 1 skein of 4 different complementary colors and 2 skeins of main color. Designer NOTE: Original was made with a discontinued yarn–STITCH NATION by Debbie Stoller™ “Washable Ewe™”: [for sample size blanket] 2 balls each 3903 Strawberry, 3540 Currant, 3501 Robin Egg, 3652 Clover; 3 balls each 3365 Earth. Each stitch count given for the full square will result in approximately the same size square as long as you adjust hook size when necessary. YOU decide how large you want your squares to be. Once you choose the size for your blanket just make sure that each square will measure that. Designer NOTE: To make sure each square I made was the same size, I washed and blocked each square as I made it. Doing so made it so I knew right away if my stitches were too tight or too loose. This is the full list of abbreviations used for all the patterns. I will be sure to add this to each pattern so you don’t have to go searching for it as your working on the square. This is the symbol key for all the charts used for all the patterns. I will be sure to add this to each pattern so you don’t have to go searching for it as your working on the square. Here is the layout of the sample blanket incase you want to follow along with the same placement and color sequence. It should help you in choosing when to use a particular color for your blanket as well. But please remember, you can mix and match any way you wish; you _do not_ have to use my same layout! Using two of the 4 complementary colors. If you want to use this pattern stitch for another pattern you need to know how many chains are used for the foundation. For the Long Wave–Foundation chain is a multiple of 14+2. In class block: Ch 30, continue to row 1. This is the foundation chain amount I do in the HD Video tutorial. This ‘in class block’ is a great way to get familiar with the stitch pattern before you commit to a larger square. It is also a good way to test out your gauge. This is the foundation chain amount I did for the full square in the sample blanket. This number of stitches will give you the same size squares as long as you use the correct hook size to get the size you want. The stitch multiple on this one is large so there isn’t a lot of wiggle room for changing chain amounts so you will have to adjust hook size to get the correct size. Designer NOTE: USE a stitch marker as I show you in the video! It will help you keep your place! Row 1 (RS): Sk 2 ch (counts as 1 ch and 1 sc), * sc in next ch, hdc in each of the next 2 ch, dc in each of the next 2 ch, tr in each of the next 3 ch, dc in each of the next 2 ch, hdc in each of the next 2 ch, sc in each of the next 2 ch; rep from * to end. Row 2: Ch 1 (counts as 1 sc), sk 1st st, sc in next st and each st to end, working last sc in tch. Row 3: Change to B, ch 4 (counts as 1 tr), sk 1st sc, * tr in next sc, dc in each of the next 2 sc, hdc in each of the next 2 sc, sc in each of the next 3 sc, hdc in each of the next 2 sc, dc in each of the next 2 sc, tr in each of the next 2 sc; rep from * to end working last tr in tch. Row 5: Change to A, ch 1 (counts as 1 sc), sk 1st sc, * sc in next sc, hdc in each of the next 2 sc, dc in each of the next 2 sc, tr in each of the next 3 sc, dc in each of the next 2 sc, hdc in each of the next 2 sc, sc in each of the next 2 sc; rep from * to end working last sc in tch. Rep rows 2-5 only, ending piece after a Row 4. Designer NOTE: Are you have a little trouble? Check out the HD Video and let me help. For this chart you will notice that the numbers on the sides count the rows. You can also use these numbers to let you know from which side you will begin reading that row of the chart. For example: Row 1 will be read from the left to right. Each of the charts provided in this pattern are written with the same number of foundation chain stitches as the ‘in class block’. I did this so that you have a full chart that allows you to see exactly what stitches go where for the entire swatch. To use the charts for the full size block you will simple repeat the stitches and rows as indicated in red on the chart. Learn this stitch pattern either with the in class block or the full size block. Once you feel like you have it, make your square for the blanket and get ready for the next square. It will be released on Thursday. Don’t forget, if you have questions or need help we are here to help you. Well, not here but over in the facebook group dedicated to the Marly Bird CAL sponsored by Red Heart Yarns. Come and join us!